Womens Chef Coats and Jackets. 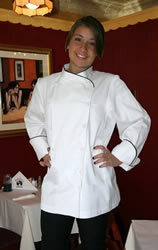 High Quality Chef Wear made in America. 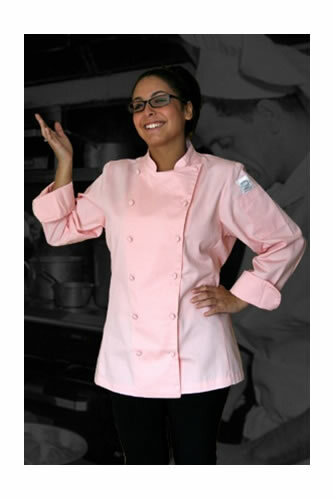 This luxurious chef coat is made especially for women, as it has two side princess panels and little more flare out at the hips. It's created in the classic professional chef coat style with a crossover neckline. The neckline is a mandarin style collar that is finished with black piping around the top. The body is double breasted and features 12 soft hand rolled buttons. The sleeves are long and are finished in French cuffs with are also trimmed with black piping on the edges. Two clear buttons are on the inside neckline to keep the jacket properly closed. The fabric is true 100% long fiber Egyptian cotton that is soft and luxurious. The jacket also has a nice thermometer pocket built into the left shoulder. Double needle top stitching around the armholes and across the shoulders gives this jacket a beautifully finished look. When you need to look your professional best, this is an ideal chef coat for women. Made from 100% long fiber Egyptian cotton, this is a truly divine fabric to wear. The design is classic. It has a mandarin crossover collar on a double breasted body. There are two side princess panels and the jacket comes out slightly at the hips. There's a nice small thermometer pocket built into the left shoulder. The finishing details are what makes this jacket a classic. It has 12 soft hand rolled buttons on the jacket front, and there are two clear buttons on the inside neckline to keep the jacket properly closed. There is double need top stitching around the armholes and across the shoulders. And, white piping accents the top of the collar and the top of the French cuffs. A true classic beauty, and it is hand made in the USA. 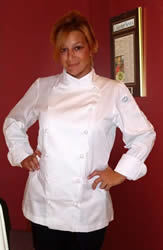 This bright white chefs coats is made for the ladies. The design is a classic double breasted look with a mandarin collar and long sleeves with French cuffs. It is made from the outstanding and proprietary Ultra PC 3000 fabric, that wicks away moisture, resists staining, and comes out of the washer and dryer looking fresh and new, with no ironing needed. The jacket body has two side princess panels and is slightly flared at the hips. It has a small thermometer pocket built into the left sleeve. 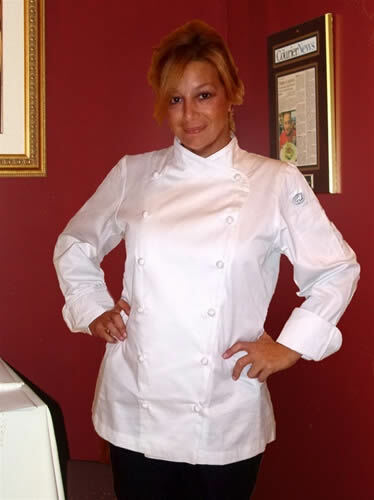 Ten French white knot buttons complete the look of this ever so professional chef jacket. 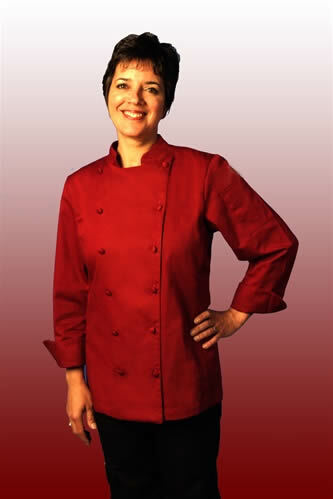 Are you looking for a chef coat that has a little more color and a lot of style? This pink cotton jacket is the perfect choice! It is made in the traditional double breasted style with a mandarin collar, long sleeves and French cuffs. Two side princess panels and slightly flared hips give this jacket a distinctly feminine look. The body has 12 fabric self covered buttons There's a great thermometer pocket set into the left sleeve as well. Crafted out of soft and luxurious 100% cotton, this jacket feels great on your skin. The color and the style of this coat are hot! Made out of a crimson red fabric, this is sure to wake you up! The fabric is 100% natural cotton, and is soft and luxurious. The styling is a traditional double breasted front with a mandarin collar, long sleeves and French cuffs. The jacket is finished with 12 fabric self covered buttons. There are two side princess panels and slightly flared hips, making the cut of this jacket work well for a woman's body. A nice added touch is the thermometer pocket built into the left sleeve. When you want quality, color and style, this is a great choice. 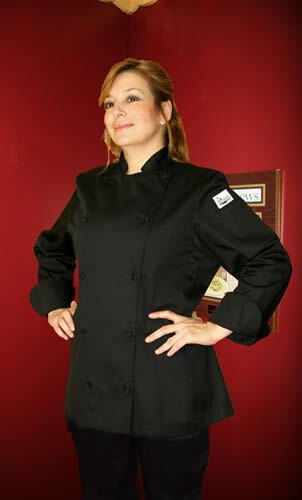 Black is always a professional looking color in a chef coat. This one has classic double breasted styling on the front. The mandarin collar provides a comfortable neckline, and the long sleeves provide protection in the kitchen. The French cuffs make the sleeves look great! The jacket is finished with 12 self covered buttons, and there is also a small thermometer pocket built into the left sleeve. The body of the jacket is constructed with two side princess panels and a slight flaring at the hips. Yes, it's actually a chef coat made for a women! The fabric is the best! It is the proprietary Ultra PC 3000 – a poly cotton blend twill that wicks moisture, resists staining and looks amazing straight out of the washer and dryer. No more dry cleaning! * Love these chef coats but live outside the US? Contact us, tell us where you live and what you want to buy and we'll send you an exact shipping quote.